There's a new mobile slot game to check out at Jackpot Capital Casino and they're giving away free spins and bonus cash so you can try it for free. RTG's newest mobile slot game, Crystal Waters, is an undersea adventure that’s generous with free spins and Jackpot Capital is one of the first mobile casinos to have it. Until the end of April, you can even take your first twenty spins on this exotic new mobile casino game absolutely free. On top of that, you can also claim a bonus up to $100! Both bonus offers are available until April 30 only. 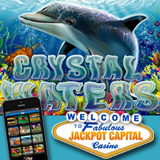 Crystal Waters is a 20 payline slot game from RTG with turtles, conch shells, sea horses and tropical fish spinning on its five reels. The Scatter symbol is a Yacht and three or more of them anywhere on the reels triggers 15 free spins. During the free games a wild Bonus Fish may appear and multiply wins up to 8x. On their desktop, laptop, phone or tablet, all Jackpot Capital players are eligible to win some of the $30,000 in bonuses that the casino is giving away every week during its Easter Eggstravaganza this month. Mobile Mondays award mobile casino players with an additional bonus up to $100.